Calling all students who are performing artists, entrepreneurs, crafters and nonperforming artists: Show us what you've got! 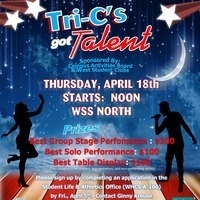 Prizes for Best Group Performance ($200), Best Solo Performance ($100), and Best Table Display ($100)--This category is for crafters, entrepreneurs, and nonperforming artists. To compete, please complete an application in the Student Life Office, WHCS A100, by Friday, April 5.